At Asbury in Charlotte, N.C., mixologist Kati Whipple combines sweet potatoes, cinnamon, cloves and nutmeg to create a simple syrup with local flavor and a nutritional boost. Not only are the sweet potatoes grown in North Carolina, but they’re also a good source of beta carotene. The syrup is the base for the popular gin cocktail offered at the bar. For Sweet Potato Simple Syrup: Roast sweet potatoes with skin on until fork tender. In saucepan on stove, mix together sugar and hot water until sugar is dissolved on medium heat. After sugar is dissolved, add cinnamon sticks, cloves and nutmeg. Let simmer 30 minutes. After sweet potatoes are finished roasting, peel off skin and discard. Add sweet potatoes to simple syrup and let cool in refrigerator for 24 hours. Double strain simple syrup, removing all solid sweet potato and spices. In cocktail shaker, combine gin, sweet potato simple syrup and cardamom bitters. Shake vigorously. 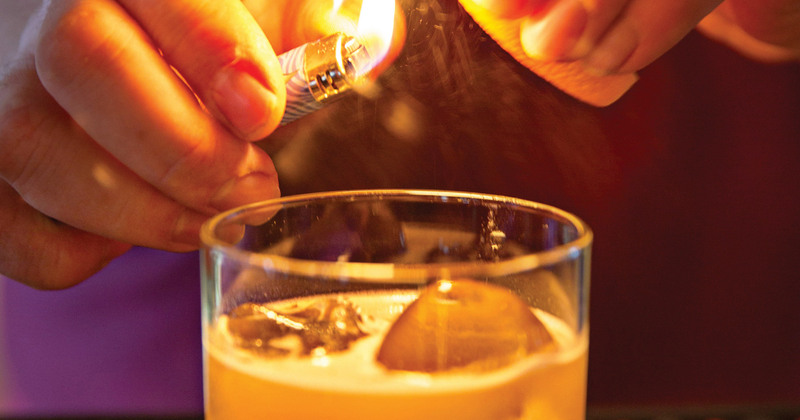 Serve on the rocks and garnish with flamed orange peel.